Yesterday evening, COM continued data collection for the thoracentesis study. Last night, Crew 207 discharged the battery charged by a bike by running 3D4MD’s 3D printing system for an additional 30 minutes. This morning’s EVA successfully completed two out of four drone mapping flights of MDRS. As well, one Part 107 drone pilot successfully piloted a camera drone to conduct an outdoor inspection of the Hab roof. This afternoon’s EVA completed flight testing of a square (60 feet) flight pattern at an altitude of 20 feet using a traditional and new drone controller by three drone pilots. A post-flight survey was completed. Crew 207 continued 3D printing items in Level 1 of the Hab. We all continued to use our 3D printed straws to identify and reuse our drinking cups and thereby, converse water consumed by washing dishes. We also 3D printed tongue depressors (which are included in the ISS medical inventory) out of food-safe, biodegradable plastic using a myriad of colours. We had a brief power interruption while 3D printing a slide drying rack out of washable, biodegradable red plastic but luckily, the 3D4MD 3D printing system was able to continue and finish the print after the power was restored. We took a photograph of a Senior Member to send a greetings from “Mars” to the Civil Air Patrol cadets of Niagara Falls #1 Composite Squadron. In the photo, a Senior Member is holding a 3D printed coat hanger which was printed on demand locally out of biodegradable plastic at MDRS. Crew 207 members are exercising on our bike to re-charge a battery to power 3D4MD’s 3D printing system. Look ahead plan : We will conduct two walking EVAs tomorrow to continue our drone mapping and controller testing. 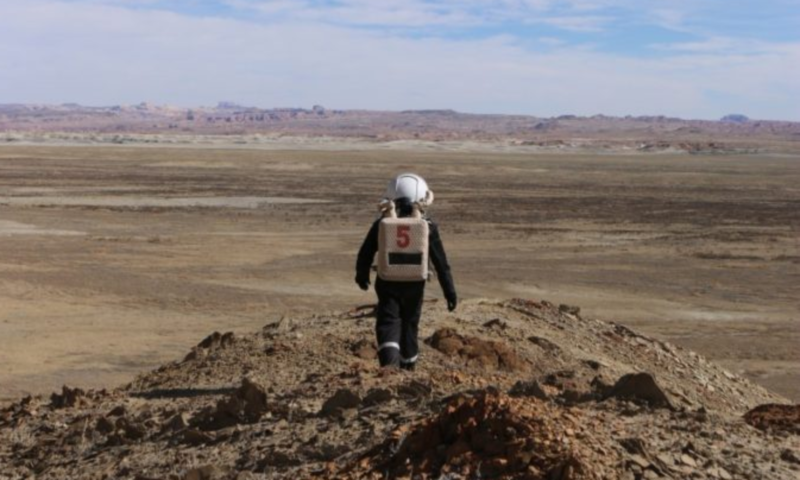 We will continue to 3D print items at MDRS to save time and money for future crews. We will continue data collection for our thoracentesis and bike-powered 3D printing projects.